Isabel Spellman, the uncompromising - okay, obstinate - twenty-eight year-old San Francisco private eye in Lisa Lutz's riotous debut novel, THE SPELLMAN FILES has her share of problems. And those problems all happen to be named Spellman. Her parents, Albert and Olivia, co-owners of Spellman Investigations, think nothing of placing their daughter under 24-hour surveillance simply to find out if she has a new boyfriend. David, her perfect older brother, who escaped the family business by becoming a lawyer, is hypercritical of just about everything Isabel says, wears, or does. Fourteen-year-old sister Rae lives on sugared snacks, considers recreation surveillance her favorite hobby, and believes that life is one endless opportunity for intra-familial blackmail. And good-natured Uncle Ray, a former cop and health food nut, now embraces gambling and drinking; and when he's not in battle with his niece Rae over the whereabouts of his favorite shirt, must be rescued from "lost weekends." Welcome to Izzy Spellman's off-kilter world. Equal parts Sam Spade and Bridget Jones, she's a damn good investigator—if only her dysfunctional family would back off and let her do her thing. Izzy's cynical—okay, wise—enough to realize that a primrose-covered cottage with a white picket fence is not in her future. That's okay with her. Ever the jaded P.I., she catalogs her ex-boyfriends with calculated brevity, reducing her romantic misjudgments to curt summaries of name, age, occupation, hobbies, duration, and last words. No sooner has she met a new man that she begins composing his exit profile. Hired to trail a husband whose wife suspects he's gay, Isabel easily determines that nothing could be further from the truth. Indeed, Daniel Castillo, the object of her subject's misidentified affection, turns out to be a gorgeous—and straight—Guatemalan dentist whom Isabel quickly zeroes in on as the future "Ex-Boyfriend #9." Keeping her family and Daniel from discovering the truth about each other, though, proves harder than she would have guessed. While other parents might be happy to learn that their daughter is dating a professional man, Olivia Spellman has a pathological distrust of dentists. When Isabel discovers that her folks are not only having her followed, but have hired Rae to do it, her outrage pushes her to quit her job at the family agency - even though it's the only job she's ever had and the only thing she does well. But just because Izzy says she is leaving the family fold doesn't mean that the family has any intention of loosening its hold on her. Besides, she's under contract. So, they make a deal - one last, ice cold case, from twelve years before when a Marin County teen went missing in the woods near Lake Tahoe. Izzy throws herself into the case, thrilled at the prospect of getting away from Spellman Investigations for good. But then Rae, who has been expertly manipulating every member of the family with her ill-gotten knowledge of their individual secrets, disappears without a trace. Izzy, who loves the little creep in spite of everything, is propelled into the most vital missing person search of her career. There has never been a heroine quite like Isabel Spellman, or a fictional family exactly like the Spellmans. 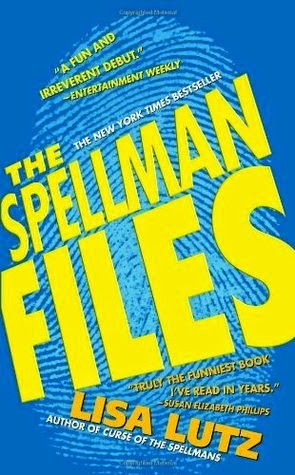 The laugh-out-loud antics that Lisa Lutz cooks up for this strangely loveable dysfunctional brood vault THE SPELLMAN FILES into the pantheon of comic crime novels that includes the work of Carl Hiassen and Jasper Fforde. With publication rights already sold in over 20 countries and movie plans underway at Paramount, Lisa Lutz's delightful book should prove to be one of the most widely read—and talked about—literary debuts of the year. Shewee, that is a long blurb. I got it straight off Good Reads. Still, I thoroughly enjoyed this book. Off-kilter is the right word. I loved the style it was written in and the tone. It's got some great characters set up and I'm looking forward to delving into the rest of the series! Sounds like a riot! I'd love to check out the series!